David J. Williams's The Mirrored Heavens starts with a bang and never ceases to gain velocity as the story speeds toward the finale. This scifi/cyberthriller yarn is a veritable page-turner. Oddly enough, the novel had been laying on my desk since last spring, and I was debating whether or not to give it a shot. It's a good thing I finally did! In the 22nd century, the Phoenix Space Elevator represents the culmination of the grand alliance between the United States and the Eurasian Coalition. Following the second Cold War, it symbolizes the new era of peace between the two superpowers. And then, the unthinkable occurs. The Space Elevator is blown out of the sky, and an insurgent group known as Autumn Rain claims responsibility for the terrorist attack. In the aftermath, armies mobilize across the face of the world and into space, while strike teams are sent out to take care of this new threat. Soon, the agents dispatched to hunt down Autumn Rain discover that the insurgents are attempting to foment chaos on a scale that could potentially spawn another World War. The worldbuilding is particularly well-done, and Williams evokes a disturbingly plausible future. One that takes into account not only the political facet of what may take place, but also the repercussions of global warming and various environmental issues. In 2105, the Treaty of Zurich is signed, signaling the end of the Cold War and its globe-spanning conflicts. Referred to as "détente," a new age of international cooperation begins. Instead of relying on info dumps, the author included an appendix containing the timeline of World History at the end of the book. The pace of the narrative moves at high-octane speed. The Mirrored Heavens is a book that you'll finish in just a few sittings. The novel is split into four parts, but it doesn't feature any chapters. Instead, the narrative jumps from one set of POV to the next in quick succession. As a result, the rhythm is such that The Mirrored Heavens is hard to put down. On the downside, an action-packed and quick-moving tale like this means that the characterization aspect will inevitably suffer. Williams offers very little in terms of characters' back stories, and they sort of reveal a bit of themselves as the story progresses. Yet even when you reach the end, you know very little about the main protagonists. Having said that, the structure of The Mirrored Heavens is such that to have dwelt more on characterization could have slowed down the story to a point where it might have killed the book. So in the end, it doesn't take too much away from the novel, though a bit more would have been appreciated. 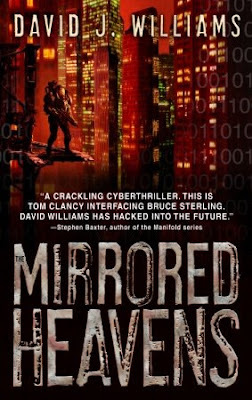 David J. Williams' The Mirrored Heavens is a definite frontrunner for my "Unexpected Surprise of the Year" Award. If Robert Ludlum, Tom Clancy, and William Gibson had ever teamed up to write a book, this is the sort of thing they would have come up with. To learn more about the author and the novel, visit http://www.autumnrain2110.com/.